I used this hairstyle on my honeymoon to keep my hair out of my face! The boat was really windy! It is really easy to create. From a side part, start a crown braid. I did my crown braid dutch style (braiding under) but any way will suffice. 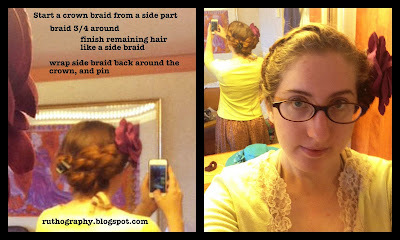 When you reach the other side of your head (3/4 of the way around) braid your remaining hair like a side braid, then twist the whole braid back around your head to lie back on top of your crown braid, and secure with a pin or a clip. I also added a large flower embellishment! I plan on making a step-by-step tutorial with pictures some time this month. Right now I'm still getting over being sick. Really! I caught some kind of flu-like thing while I was still getting over food poisoning from Mexico. How are you guys doing? 23 days until we celebrate Jesus' birthday!